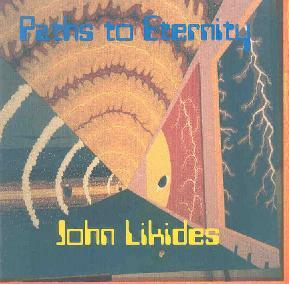 John Likides - "Paths To Eternity"
Infused with mystery, echoing a utopian future and a distant, half-forgotten past, the electronic music of John Likides is like a journey through the unknown, which arrives nonetheless, at something tantalizingly familiar. Likides was part of the revolving door collective that was Alien Planetscapes back in the 80’s. These days, he is both an author and a musician. His flowing guitar and keyboard-based instrumentals are intended as the soundtracks to his books, romances concerning reincarnation and technology. Not really at all like the Alien Planetscapes music, Likides’ music floats along on pulsing rhythms, with breathy washes of synthesizer and melodic guitar. And while it borders sometimes on a New Age kind of sound, Likides likes to play with sudden and unexpected changes in tempo, jolting the listener from passive reverie to active attention. The rhythmic structures of his compositions are sometimes very deeply computerized; at other times, they echo the exotic cadences of the tribal world, emphasizing this connection between current and future technology and the ancient world. While Paths to Eternity may be the soundtrack to a book, the music is nonetheless quite enjoyable in its own right. According to the liner notes in the CD, his latest book, Out of the Labyrinth, is available from http://www.xlibris.com/OutoftheLabyrinth.html, though I wasn’t able to find it there. However, it is available by writing to the above address as well.